Pruning roses is intimidating to many gardeners, but actually very good for the plants. 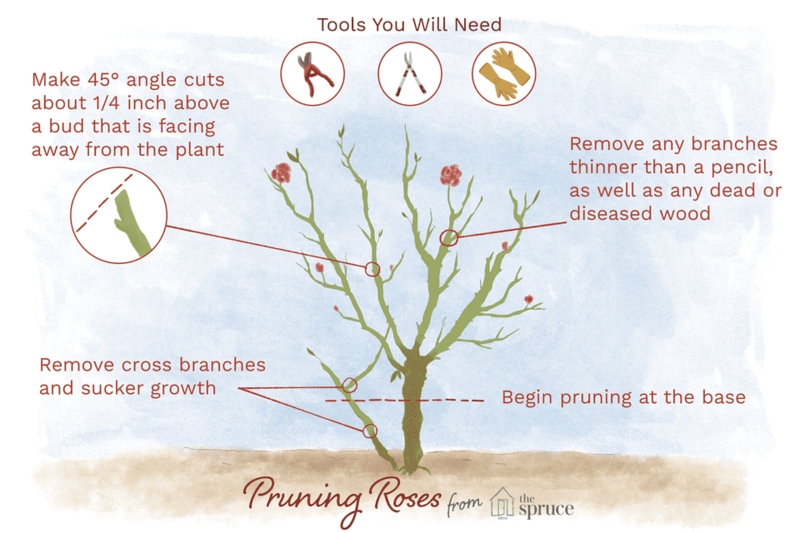 Becoming an accomplished rose pruner takes time and practice, but keep in mind that it is very hard to kill a rose with bad pruning. While there is a great deal of disagreement among rose experts regarding how and when to prune roses, it is generally agreed that most mistakes will grow out very quickly and it is better to make a good effort at pruning roses, even if you make a few mistakes, than to let them grow rampant. Remove dead wood: this will also reduce disease from pests. Look at the overall shape and health of the plant, but begin pruning from the base of the plant. Make sure it is a clean cut, not ragged. Remove all broken, dead, dying or diseased wood. This includes any branches that look dry, shriveled or black. Cut until the inside of the cane is white. Remove any remaining leaves. This allows the plant time to adjust. Timing is determined by the class of the rose plant and the hardiness zone in which it is being grown. Most rose pruning is done in the spring, with the blooming of the forsythia as a signal to get moving. If you don't have forsythia, watch for when the leaf buds begin to swell on your rose plants, meaning the bumps on the canes get larger and reddish in color. You want to prune before those buds break open. This should be after the nightly hard frost has ended for your location. Hybrid tea roses are the most particular about pruning. If you don't know what type of rose you have, watch the plant throughout the growing season. If it blooms on the new growth it sends out that season, prune while dormant or just about to break dormancy, as stated above. If it blooms early, on last year's canes, don't prune until after flowering. Modern Ever-Blooming Roses and Floribunda: These bloom best on the current season's growth. Prune hard (1/2 to 2/3 the plant's height) in the spring and remove old woody stems. Leave three to five healthy canes evenly spaced around the plant. Cut them at various lengths from 18 to 24 inches, to encourage continuous blooming. See more on how to prune Floribunda roses. Hybrid Teas and Grandiflora: These also bloom on new wood and should be pruned in early spring. Remove dead and weak wood. Create an open vase shape with the remaining canes by removing the center stems and any branches crossing inwards. Then reduce the length of the remaining stems by about half or down to 18 to 24 inches. You can allow the older, stronger stems to be a bit longer than the new growth. During blooming season, deadhead blooms to a strong node. Rip out all suckers. See more on how to prune hybrid tea roses. Ramblers: Prune to remove winter damage and dead wood or to shape and keep size in check. Ramblers bloom only once and can be pruned right after flowering, all the way back to 2 to 3 inches if you wish. They will quickly regrow and you won't lose any flowers, the following season. Modern Shrub Roses: This group is one of repeat bloomers, blooming on mature, but not old, woody stems. Leave them unpruned to increase vigor for the first two years and then use the "one-third" method. Each year remove one-third of the oldest canes (in addition to any dead, diseased or dying canes). See more on how to prune Knock Out and shrub roses. Climbers: Climbers may repeat bloom. Prune these early, to remove winter damage and dead wood. Prune again, after flowering, to shape and keep their size in check. Remove and replace old and weakening long canes as needed. See more on how to prune and train climbing roses. Alba, Centifolia, Damasks, Gallica, and Mosses: This group blooms only once, producing flowers on old wood, and don't require much pruning at all. Prune only to remove dead or thin wood and to shape the plants and prune after flowering. What is the Correct Time to Prune Your Hydrangeas? What is the Best Time to Prune Your Shrubs?